It’s a hot evening in July and I’m perched at my desk, sweating and grimacing over an email. I’ve just opened my latest course and at midnight the price doubles – which seems like something people would want to know, right? Especially the people who attended the webinar? I’ve emailed everyone who expressed interest twice already – once on Wednesday and once on Thursday. Is a third time overkill? Am I going to annoy everyone? BECAUSE OH GOD WHAT IF I ANNOY EVERYONE. It would be so much more comfortable to close my laptop and pour myself a drink. But instead of drinking a tall vodka gimlet, I sucked it up, got uncomfortable, and sent that third sales email. Being slightly uncomfortable for 30 seconds brought in enough money to pay for a family vacation or two of those huge wheels of Parmesan cheese. While I love an inspirational quote as much as the next white lady, I’ve always given these particular sayings a bit of side eye. Like, how do I know the difference between Challenging Thing That’s Actually Good For Me and Thing I Genuinely Don’t Like, Never Will, And Makes Me Hate Life? What’s the difference between knowing myself + my limitations and selling myself short? I’m not sure I can answer that probably-universal question, but I think I’ve found a workaround: be willing to make yourself slightly uncomfortable. Like, 25% more uncomfortable. 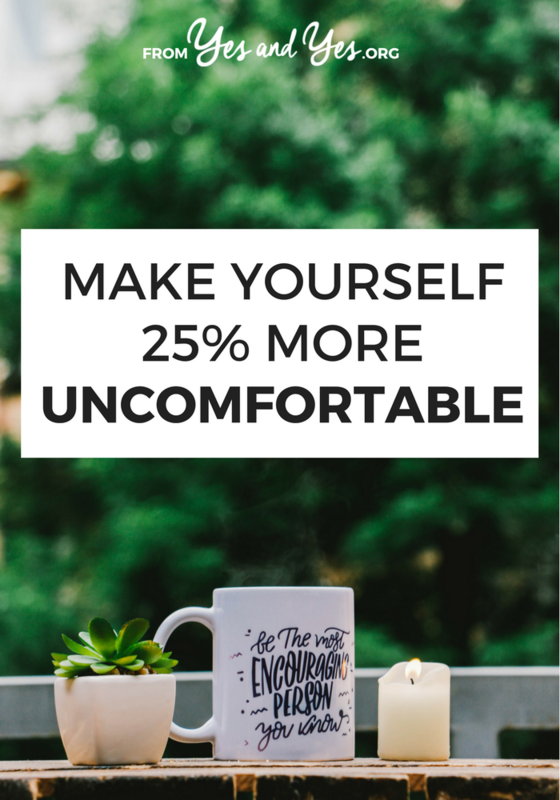 Making yourself 25% uncomfortable will probably yield 100% better results. You hate networking and small talk? Me too. On the off chance I find myself in room full of strangers, I usually talk to two people and then wander off in search of the vending machine or pet. What if – instead of giving into my nearly immediate desire to leave – I pushed myself to talk to one more person? Or two? I’m not forcing myself to stay for three hours or talk to 15 people. I’m not making myself do something I hate. I’m allowing myself to be slightly uncomfortable for a short amount of time. In the process, I’m doubling how many people I’ve talked to. Apply to three jobs that you’re obviously qualified for and one that would be a bit of a stretch. Apply to your ‘back up’ schools AND the fancy school. Email the painfully good-looking person on Okcupid you’re pretty sure everyone, ever is emailing. Not to sound like your mom but you never know what’s going to happen. Someone’s going to get that job/scholarship/cutie; it might as well be you. Click To TweetYou might be amazed by what happens when you reach out to the Big Deal Long Shot. Kathleen and Emily landed some huge guests on the first season of Being Boss just by asking. I know someone who applied to Harvard as a long shot and got in! Side note: did you know most women won’t apply for a job unless they meet 100% of the qualifications while men will apply for jobs they’re 60% qualified for? For the love of Pete, apply for that job you don’t think you can get. One of my favorite/worst habits is checking email or social media anytime a project gets hard. Trying to connect Getdpd and Deadline Funnel? BETTER SEE IF ANYONE’S EMAILED ME. Struggling with a new sales page? Clearly, now is the time to see what’s happening on Facebook! Can’t write an engaging intro to that blog post? Let’s watch Instagram Stories! So when I see myself doing this, I note what I’m doing (“I want to check Twitter because I’m overwhelmed by all this code”) and then sitting in that discomfort. I’ll spend another five or ten minutes hashing it out and then – if I still want to – I’ll go check email. Sometimes I really do need a break. A lot of times I’m letting myself off the hook and distracting myself from work I’m 100% capable of doing. Didn’t hear back from that job or academic program? Send a follow up email. Contractor or client ignoring your invoice? Send a follow up email. Meet with someone awesome and want to hang out with them again? You guessed it! Send a followup email. I know followup emails can feel awkward or needy. It feels vulnerable to say “I really want to work at your company!” or “I want to be friends!” It’s a lot more comfortable to devotedly hope that someone will remember you and what you want. Here’s the thing: we’re all busy and we all have full inboxes. Emails and text messages really do get lost in the shuffle! Make it easier for people to help you and give you want you want by (charmingly! non-demandingly!) reminding them. When we see people who have things we want – a cool job, a great relationship, a lovely home – it’s easy to imagine they’re somehow different than us. That they have a secret super power that made of all those things possible. And maybe they do! Or maybe they just made themselves a little bit uncomfortable and sent a second email. I want to hear from you! How often do you do thing that make you uncomfortable to get what you want? Tell us about it in the comments so we can be inspired! P.S. It sounds strange, but getting outside of your comfort zone is a habit you can develop, just like brushing your teeth or making your bed. This will help – and it’s free! Oh my gosh, I am so guilty of switching browsers/apps when I get to a hard part in my work. Thank you for calling me out! I’m actually in a little bubble of comfort right now – though I know myself that it won’t do me good in the long run. I’m so afraid of failure I rarely try anything new! I need to up my networking game and my people skills in general. I’ve improved a LOT over the years already, but I could still be much better! Seriously though, great advice. I have a bad habit of working on a task for a little while, getting to a “good stopping point” and then checking FB. I do this way too many times in one day. Today I was doing client work, several 30-45 minute tasks, and I really wanted to call it quits for the day, but I forced myself to do just one more. Mostly I think I need to ban myself from FB during the day. I work for myself now, but I do remember in my cubicle days being nervous about applying for jobs I wasn’t 100% qualified for. But one day I realized if I looked at job postings as a wishlist, it gave me a different perspective. They don’t necessarily expect to get someone who meets everything on the list, but you can usually figure out which things are reasonable to learn on the job and which ones you probably need to know going in. 1. Was working on some boring client work I didn’t really want to be looking at. 2. Decided to check email. 3. Clicked email from SVB, clicked this article. 4. This article told me to get back to work. Damn, Sarah. It’s like you know me! I landed my biggest client after sending a follow-up email that I was SURE was obnoxious. It wasn’t! So inspiring! Just followed up on a bunch of jobs I’ve applied to. Thank you!! I love it when I get a virtual kick in the pants. I can confirm on the “apply for stuff you’re not sure if you qualify for it” front from both sides. I’ve done it as a job seeker 3 times and changed my life for the better 3 times when I succeeded (college newspaper make me your copy editor just cuz I like words and people bring their essays to me, tech support guy make me a tech just cuz I can learn and understand Google results and help old people use their antivirus, current awesome job hire me to copy editorize spreadsheets and teach people to use software because editor/tech support). And as a former HR prescreener, no one is offended when you out kick your resume coverage – the worst that happens is they don’t call and have forgotten you the next day. So yes, GO FOR IT. You may be just what they’re looking for and they didn’t know it. Thanks to people like you (and Captain Awkward, and Kelly “Adulting” Brown), I’ve truly started to become the person who follows up with promising opportunities/potential friends, and sends (hopefully non-creepy!) love letters to people when they make something I genuinely connect with. Some of this can be pretty fear-based–i.e. “If I don’t reach out to that cool girl from the party, I will continue to have No Friends in this new city.” “If I don’t follow up with these people who expressed interest in my copywriting, I’m going to eat into my savings next month.” But also, sometimes what you need to do something that makes you uncomfortable is to recognize that the alternative is Truly Much Worse. Love letters = “Hey, thanks for making this thing” emails or IG messages, I should say. I’m not out here with perfumed stationery. I had cacio e pepe served out of a cheese wheel in NYC last year and it was one of the HIGHLIGHTS OF MY LIFE. I’m inspired over the applying for that ‘long-shot’ opportunity. I have to admit that most/all of the time I apply for jobs I know I can do. There’s jobs that have come up that sound great, and I have a little experience, but doubt myself because I haven’t done some of the aspects of the job. You’ve inspired me to apply 🙂 Thank you for this post! My work is pretty different from yours and a lot of what you write about – I’m the entire software team for a 3 person startup. But this and a lot of similar posts still really speak to the people-interaction side of my work. This topic in particular is one that I really need to work on. Cheers! Great read, thanks for the “push”. We all need to hear it some time. 25% I can do. Sometimes that means 100% but just for a minute. Thanks for the nudge.